The look of Southern Charm with the feel of a tropical retreat! 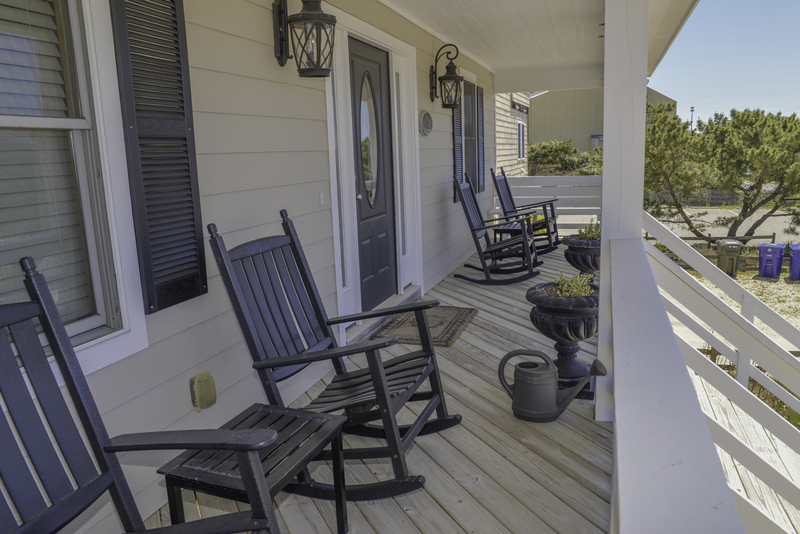 An outstanding Outer Banks Vacation Experience awaits when you choose High Cotton in Nags Head. Tropical colors & Beach decor immediately transport you into beach-living mode. This Beautifully Decorated Oceanfront home boasts Fantastic Ocean Views, a Private Swimming Pool & Hot Tub & is sure to provide you a relaxing & pleasurable vacation. With three spacious levels, there is plenty of room for your family to relax & enjoy time together as well as to spread out into small group gatherings. Using double appliances chefs in your family can easily prepare fabulous meals for your oceanfront dining experience. 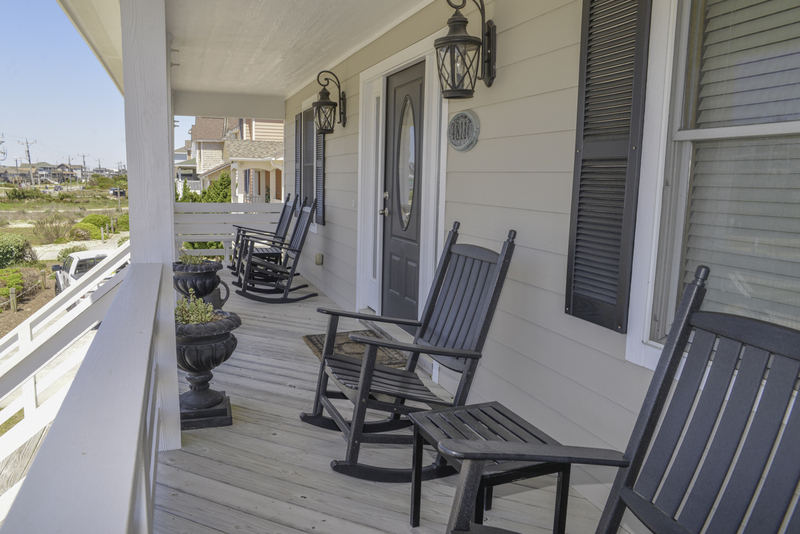 Ample deck space, with chairs & loungers, invite you to sooth away cares & soak up sunshine. Covered decks on the mid-level are perfect for wave watching or just rocking to the ocean breeze. 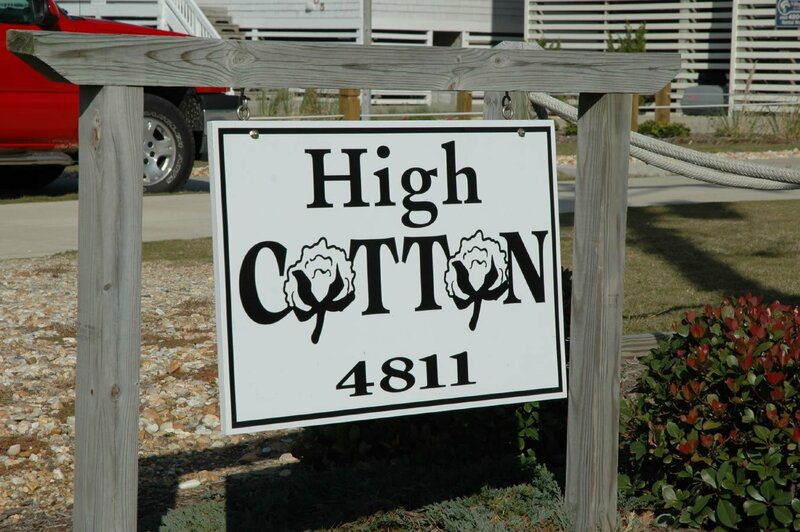 Those who stay in this luxurious beach retreat will truly be in "High Cotton". Paradise awaits you in this Vacation Home convenient to shopping, great dining, & area attractions. Ground Level: Parking for 5 Cars, Covered Entry, Elevator to All Levels , Game Room w/Foosball Table, Wet Bar w/Full Size Refrigerator, TV, VCR, 2 Bedrooms (1 w/2 Singles & TV & 1 w/Duo Bunk w/Trundle & TV), Full Bath, Access to Patio Area w/Private Swimming Pool, Hot Tub, Private Walkway to Beach, Dune Top Deck, Enclosed Outside Shower, Fish Cleaning Station, & Charcoal Grill. Mid Level: 4 Bedrooms (2 Oceanfront Master Suites w/Kings, TVs, Full Baths, & Access to Oceanfront Covered Deck w/Ocean Views & 1 Master Suite w/King, TV, & Full Bath, 1 Master Suite w/Queen, TV, & Full Bath w/Folding Seat, Handrails & Wheelchair Accessible Sink, Front Covered Deck, & Back Covered Deck w/Deck Furniture & Steps to Pool Area. Top Level: Living/Kitchen/Dining Area w/ Double Appliances & Exceptional Ocean Views, TV, DVD, Home Theater w/Surround Sound, Game Table, Wet Bar w/Free Standing Ice Maker, Half Bath, Master Suite w/King, TV, & Full Bath, & Large Oceanfront Sun Deck w/Deck Furniture. Features Include: C/AC & Heat, Washer/Dryer, 2 Full Size Refrigerators, 2 Dishwashers, 2 Ovens, 2 Microwaves, Phone, 9 TVs, VCRs, DVDs, Stereo w/CD, Wireless Internet, Ceiling Fans, Games, Books, & Pool & Deck Furniture. No Pets. This is a Non-Smoking Unit. We love the house especially the large kitchen and common area on the top floor. Very quiet and wonderfully appointed. 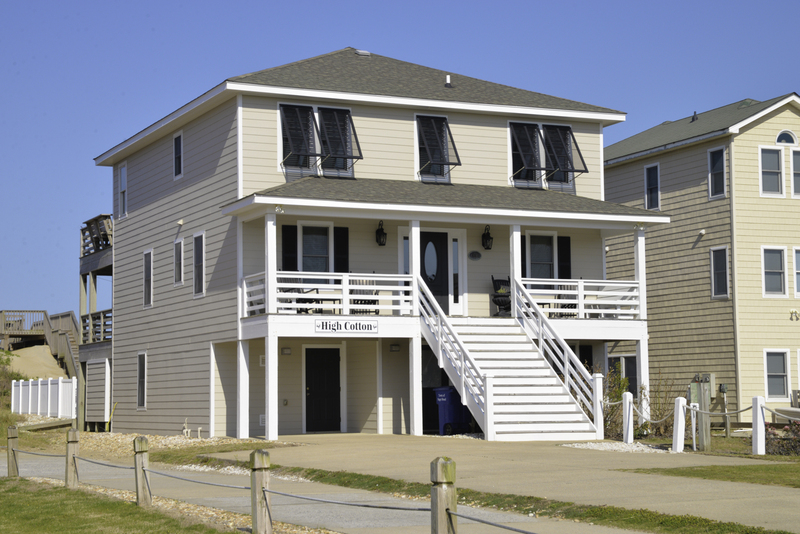 Has everything that you need for a wonderful vacation in Nags Head. SO appreciate good mattress and pillows! The nine of us thoroughly enjoyed High Cotton and thought it was well maintained. This home is truly one of the best stocked homes...especially the kitchen has every appliance you need with plenty of everything and we truly appreciate it. We thoroughly enjoyed our stay at High Cotton. The home was very well maintained and clean. Everything was in working order and the kitchen was the most well stocked we have seen. We did not need a thing. Thank you so much. Extremely well stocked kitchen and home. The home is comfy and beautiful all at the same time. We look forward to staying again next year at the same time. We were very pleased with the house. Kitchen was awsome! Liked the large table where the whole family ate the evening meals. Liked the length of the walkway to the beach. We all loved this property. It was clean, comfortable and a great location. One of the best we've rented in OBX. We loved the house decor and enjoyed staying in your home. Very nice place. Fits all our needs. We have stayed there two years and are going back next year. Very well stocked kitchen and beautiful house! Our group included several people who love to cook. Thank you for having a kitchen so well equipped. This was the best place we have rented in the 15 years coming to OBX. The beds were perfect for restful nights, the kitchen was truly well stocked for cooking and there was ample room. We will definitely be back next year. This house is in a great location. Close to restaurants and shopping. The house is beautifully decorated and has a well stocked kitchen. We have been coming to the Outer Banks for over 10 years and this is one of the best houses we have rented. A lovely home! Well equipped kitchen. The house is absolutely beautiful. The photos don't do it justice. This home was beautifully furnished and well stocked. We thoroughly enjoyed our stay! The interior of the house was very clean. The kitchen dining area was the best ever. Well stocked, two stoves and microwaves, and even two coffee pots. High Cotton is in a great location. Kitchen well equipped with ice maker and second refrigerator on lower level. Rooms are nicely furnished. Great place, beautiful beach area and location to all stores for food and accessories. We love this home. This is our 6th year visiting! The kitchen is extremely well equipped--we have been renting in OBX for 25 years and this place is at the top of the rentals we have occupied! The decor is bright, charming yet relaxed. It is truly a home away from home. Best view on the beach from a beautifully decorated and appointed home. You can't go wrong if you're in High Cotton! An excellent place to stay for a great vacation. House was like new and immaculate. Thanks to the owners for the opportunity to stay there for two weeks. They have done a wonderful job redecorating it is such a pleasure to stay at High Cotton. We loved the house and found it to have a real family appeal. The kitchen was super! Loved the rockers on the front porch. Very homey. 2 dishwashers, stoves, and refrigerators were great and a big help in preparing meals and storage. More rentals need to follow your lead. It is a major factor in us renting this home. Thanks for all the thought you have put into this house.